But just how long can this political deadlock continue and will the foreign power’s backing of opposition leader Juan Guaido eventually fizzle out? Sputnik spoke with Julia Buxton, Professor of Comparative politics at the Central European University for more insight on the issue. Sputnik: Is US military intervention in Venezuela inevitable? Julia Buxton: Obviously, the manoeuvres by the US, and these not so subtle psychological messages such as John Bolton scrawling on the back of his notes that the US was planning to re-deploy five thousand US troops from Afghanistan to Colombia, has really ratcheted up concerns that there will be a US military intervention. Sputnik: How do you see the situation developing? 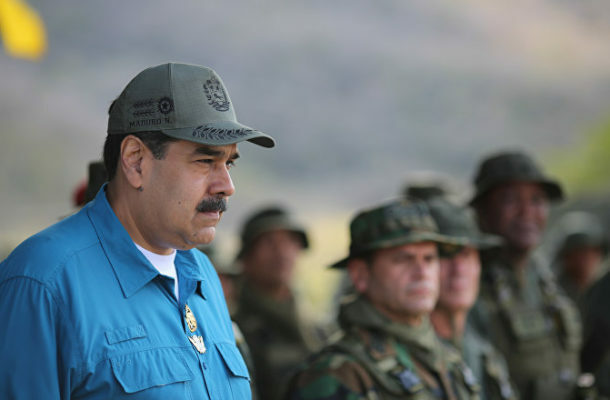 Julia Buxton: It’s been quite astonishing that Maduro has given the weight of international opinion against him, managed to stay in power, but clearly he is supported by the military, he’s supported by Russia and China and Turkey currently, and a number of EU countries have also expressed some dismay of the EU’s quick recognition of the Guaido presidency. The situation could carry on indefinitely; the challenge for Guaido is maintaining opposition unity around his interim presidency.We’re in a stalemate in Venezuela, and this is why negotiation and dialogue is the only way forward.